Do you have a compost bin? Do you even compost? If not, you’re missing out on a wonderful way to add nutrients to your gardening this spring. If you have never had a compost bin, now is definitely the time to start thinking about building one and I have just the list of 35 cheap and easy DIY compost bins that can get you started. Composting is simply breaking down organic materials into a nutrient rich soil that you can then spread on your vegetable or flower gardens. It also lets you dispose of certain waste materials without throwing them in the trash so it’s a really environmentally friendly project. You can use so many different things in your compost from coffee grounds and old veggies to fruits, teabags, grass clippings, cardboard egg boxes, leaves and so much more. Creating the compost is the easy part…but first you need a compost bin, which is why I have collected these great DIY compost bin plans for you. From plastic jugs to cardboard boxes, there is definitely something on this list that will get you on your way to composting. Many of these can be made with upcycled or repurposed items, and you know how much I love to repurpose. By the way, have you seen these 20 carpet repurposing projects? If you have always wanted to begin a compost bin, now is your chance. These bins are all so easy to make and many of them don’t require any special tools or skills. 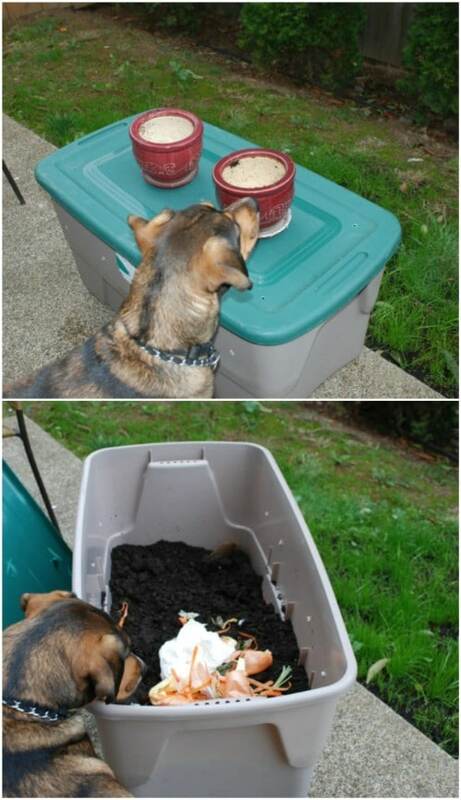 Did you know that you can make a compost bin out of a five gallon bucket? 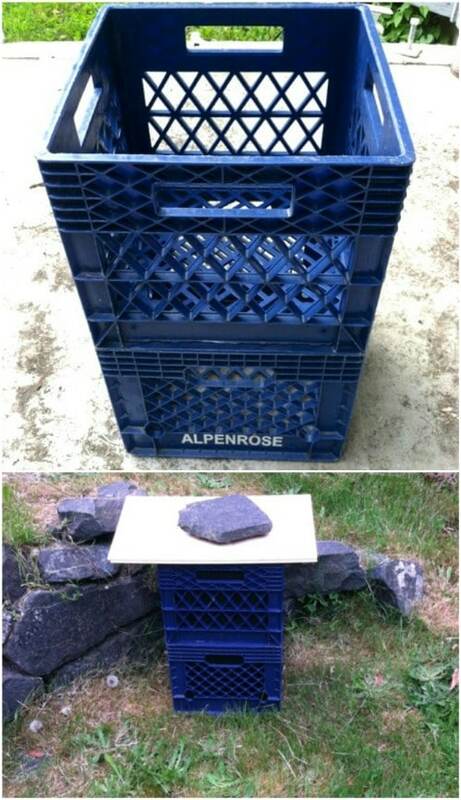 How about creating a quick and easy bin from cinder blocks? You’ll know exactly which DIY compost bin is for you when you get through these and I can’t wait to hear how your compost pile is growing! Oh, and be sure to take a look at these 30 backyard succulent gardens that you can DIY this spring. You can use your compost to help them grow! Some left over lumber from other projects – or a few old pallets – give you the makings for this great two bin compost bin. These bins measure three feet by three feet in diameter and are about two feet tall, although you can alter those dimensions if you need to. 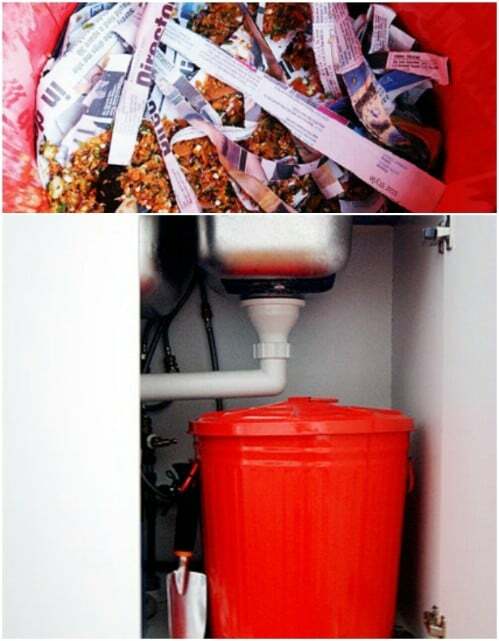 The plans are really easy to follow and give you a double compost bin that helps you to keep your compost organized – if you plan to organize your compost, that is. Here is a three bin compost bin that has so much room to help you to create nutrient rich soil. Believe it or not, this one really is not that difficult to build and it is really huge so it will create loads of compost. You can put this anywhere in the yard where you have room for it and even paint and decorate it a bit if you wanted. 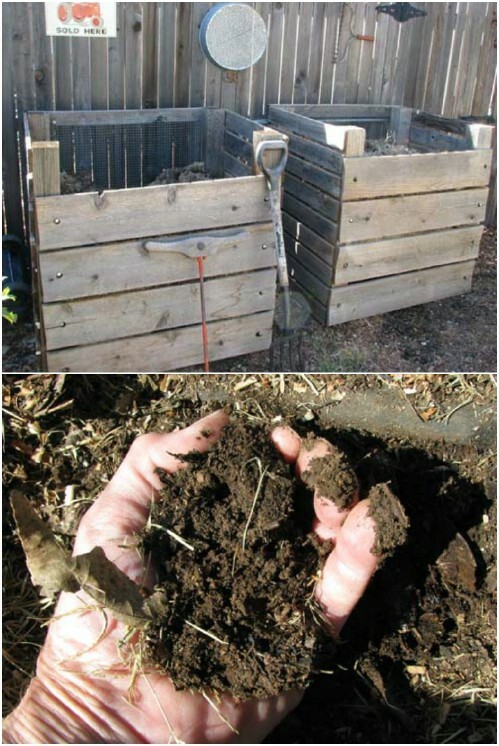 You can easily build a worm compost bin – worms help to create nutrient rich soil, by the way. This particular bin has three tiers so it holds loads of soil and worms and it is really simple to build. You will need a power drill and a saw as well as a few other minor tools and supplies. This one is so easy that you can have it built in less than a weekend. Just a five gallon bucket is all you need to get started with your composting. If you don’t have the time to build a larger bin, this one will work nicely. 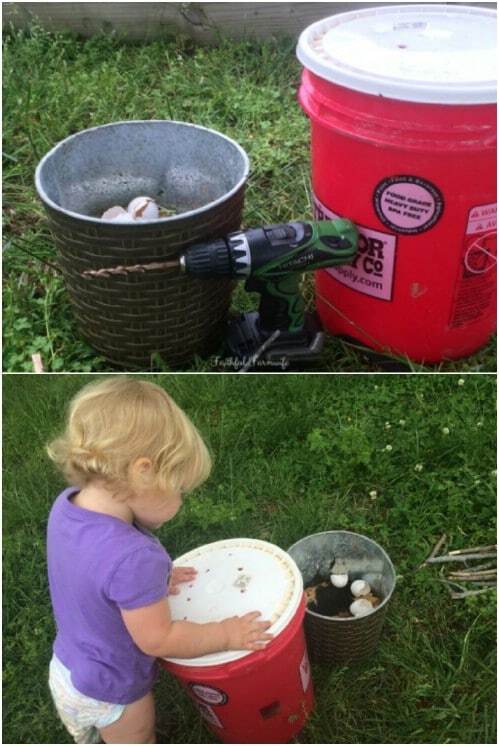 You just need the bucket as well as a trash can or stainless steel bin and a few tools. This one takes less than an hour to build. Just think, an hour from now you could be adding veggies and other leftovers into your own compost bin. When you are building a compost bin, you want it to be easy to access. You definitely want to be able to easily toss in your old foods and other green materials and it would help if you could also access the soil easily, right? This angled compost bin makes access really easy and it is pretty easy to build, too. I love upcycled cardboard box projects. 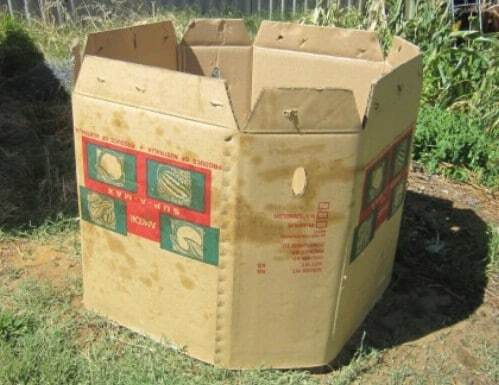 Honestly, I have so many boxes on hand at all times that it is great to find something worthwhile to use them for…like this cardboard box composter. You make this from a cardboard bulk box, like the ones that come into the grocery store with fruits and vegetables in them. Check with your local grocery about grabbing a couple the next time they have a shipment come in. 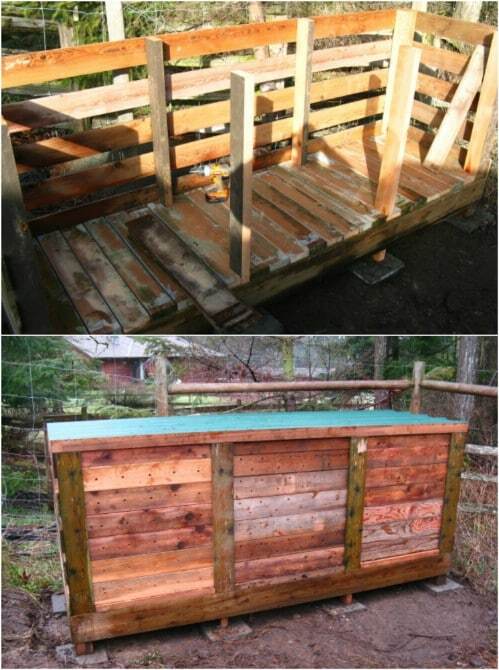 These compost bins are made from cedar posts, which you can repurpose or buy pretty cheap at a lumber yard. The front of the bins have removable boards so that you can easily reach in as needed to stir your compost or add to it as you need to. The compost comes out the bottom of the bins so there is no reaching in or leaning over to get to it. 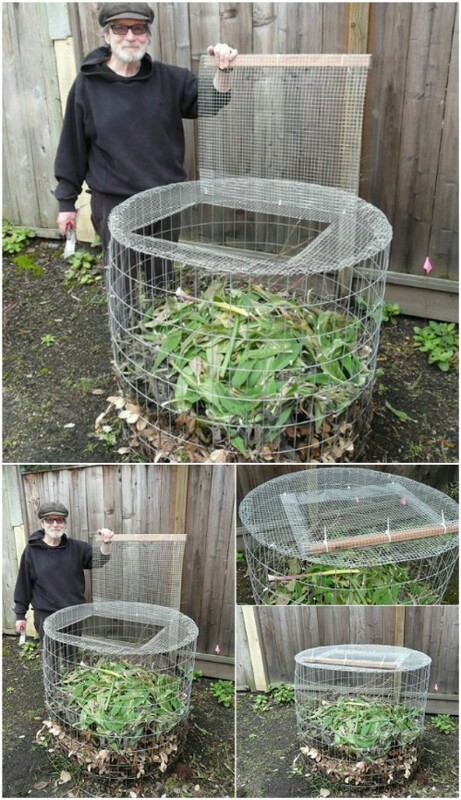 You really can build a compost bin out of just about anything, including old lattice. If you happen to have some cedar lattice on hand that you are not using, you can use that to make boxes to hold your compost. These go together really quickly so you could build two or three of them in an afternoon, and they are really decorative, too. 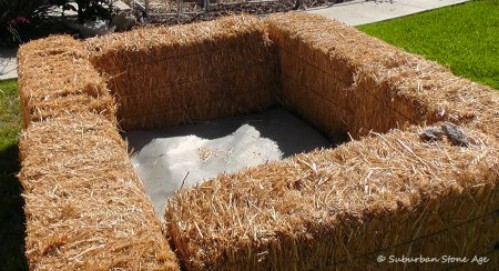 You can also build your compost bin from cinder blocks. If you don’t have any cinder blocks to use, they’re pretty inexpensive at home improvement stores or check with your local concrete company to see if maybe they’ll offer a discount since you’re using them for green projects. For this one, you use cinder blocks and boards to create a really large bin that will hold so much compost! One of the things that you have to remember about composting is that it needs to be turned or stirred from time to time. 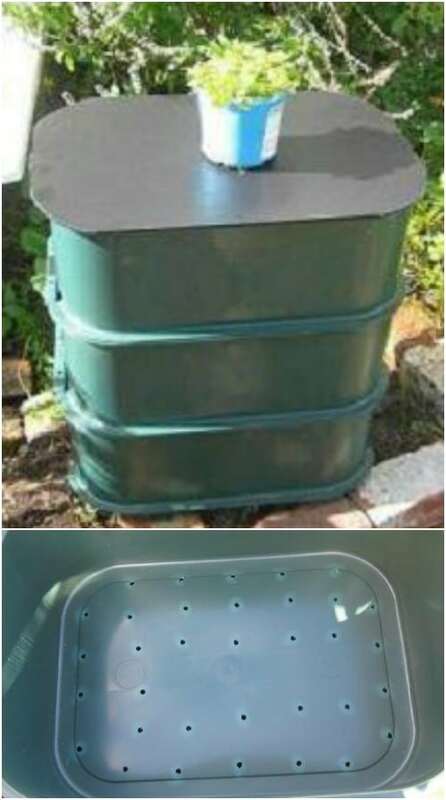 This drum style compost bin makes that really easy to do and this is an easy one to build. 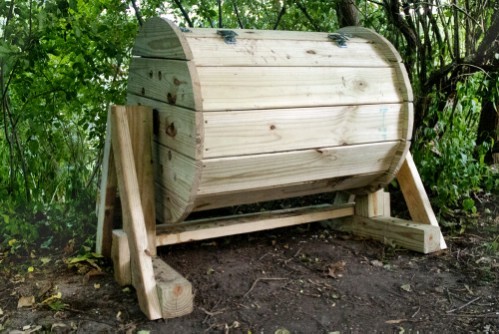 It rotates so that your compost can breathe which helps with the odor and you can build this in just a couple of hours and for less than $20! 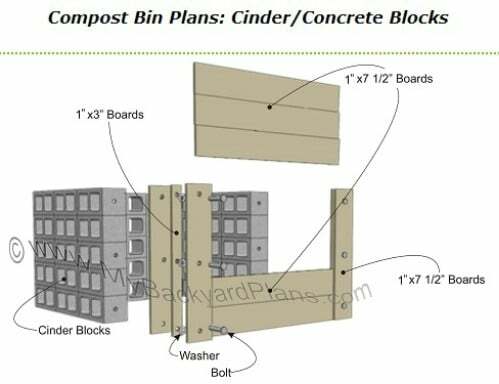 Here is another plan for a compost bin build out of concrete blocks. This one uses only the blocks and then you just lay a wooden board on the top to keep everything stewing nicely inside. This one doesn’t require any power tools and can be built in just a couple of hours. And, if you have the blocks on hand, this one is free to make. 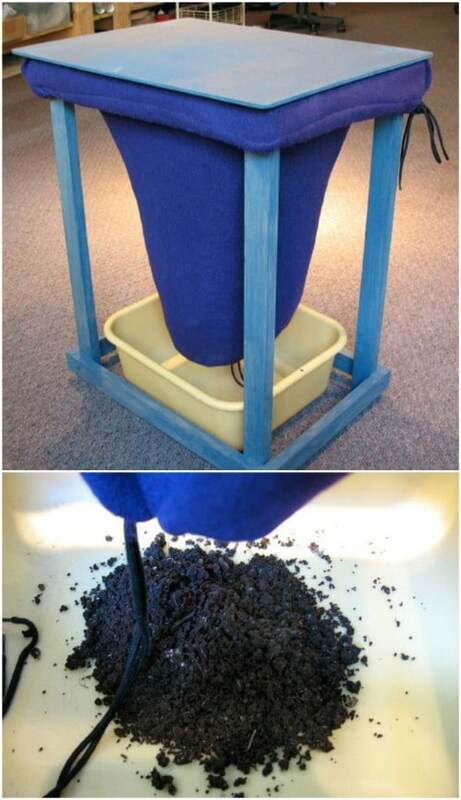 Making your own compost bin does not have to be difficult or expensive…which is the case with this one that is made from hardware cloth. You need mesh hardware cloth for this, which is pretty inexpensive and you can buy it in rolls so you can make sure to get all that you need. You’ll also need a bit of wire fence and cable ties to hold everything together and something for the lid, like a plank of wood. 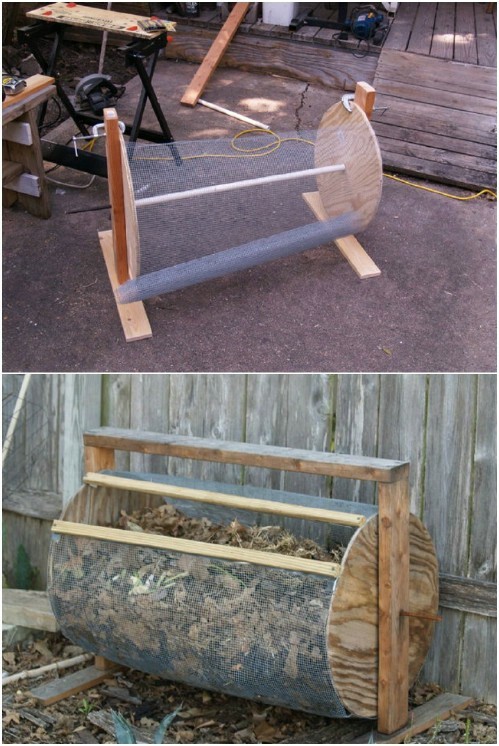 Here is another wonderful compost bin that takes the work out of rotating your compost. This one is made from a plastic barrel and a few 2X4s. There are so many home décor and furniture projects that you can make from 2X4s! The length of your boards will depend on the barrel that you use. You have to make sure that the boards are tall enough to get the barrel off the ground for rotating. There is no rule that says your compost bin has to be outdoors. If you live in an apartment building or otherwise just don’t have yard space, this simple DIY kitchen compost bin is perfect. You can make your own with an old coffee can or any number of other materials and just keep it right there in the house where you can add to it freely. 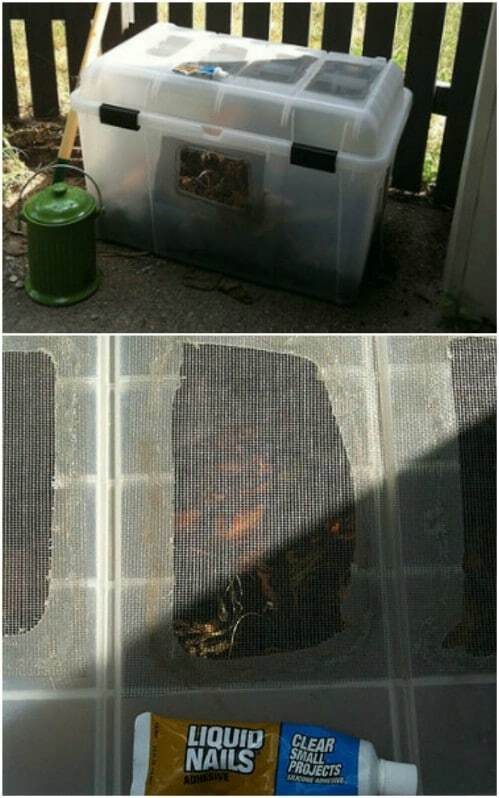 Turn an old plastic tote into a compost bin! You don’t have to spend a lot of money on this. If you don’t have a tote that you can use, hit up the Dollar Store or watch for those after Christmas sales. Walmart normally sells red totes for about half price after the holidays. 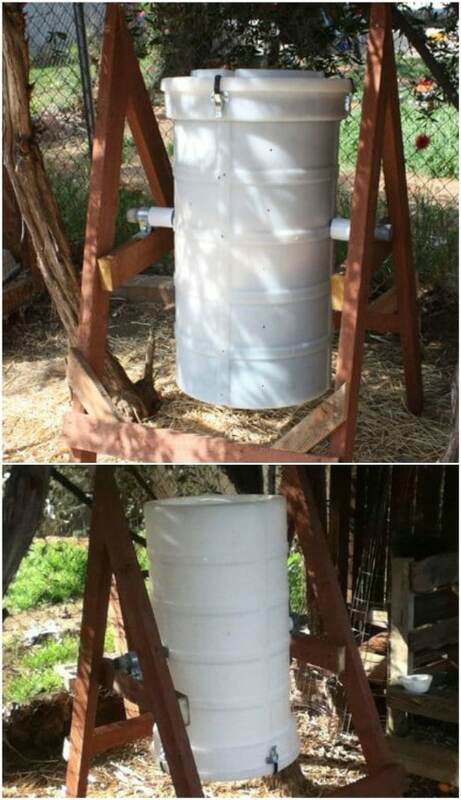 This DIY compost bin is made from plastic barrels and it has two tiers. It is also rotatable so you can keep your compost turned so that it produces better. You can use any two plastic barrels or drums that you have on hand and if you don’t have barrels to use, check with local manufacturing companies to see if they have any that they are willing to part with. There are so many ways to upcycle old tires! 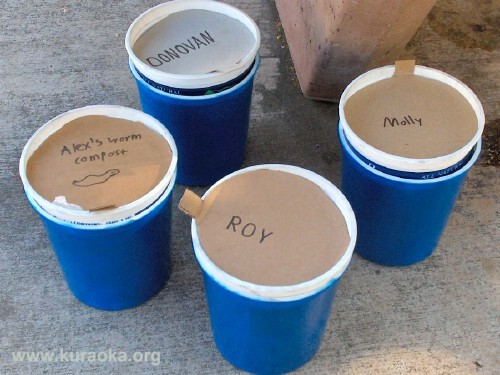 For one, you can use them as the base for your compost bin that is made from an old metal drum. These drums are so easy to find and once you put this one together, the tires make it so easy to rotate your compost and keep everything mixed up. You just roll it around! 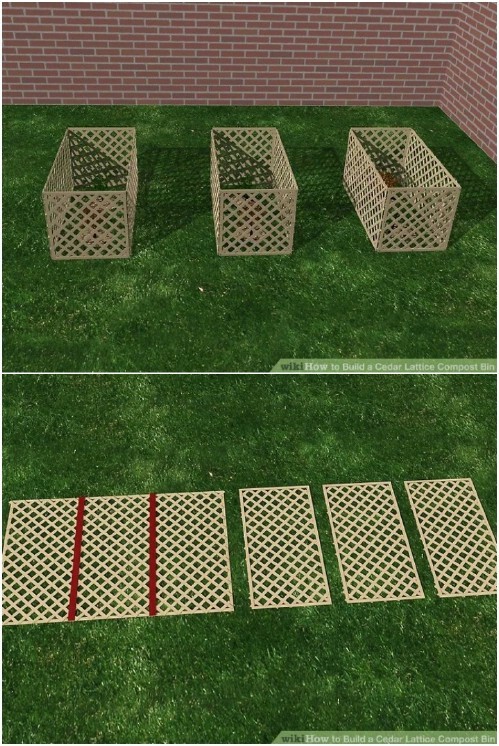 This compost bin is made from repurposed milk crates and it is one of the easiest things to build…ever. The gist is to just cover the bottom so that your compost doesn’t fall out and then create a lid so that it stays covered. This one is also really easy to rotate so that you can easily break it down when needed. 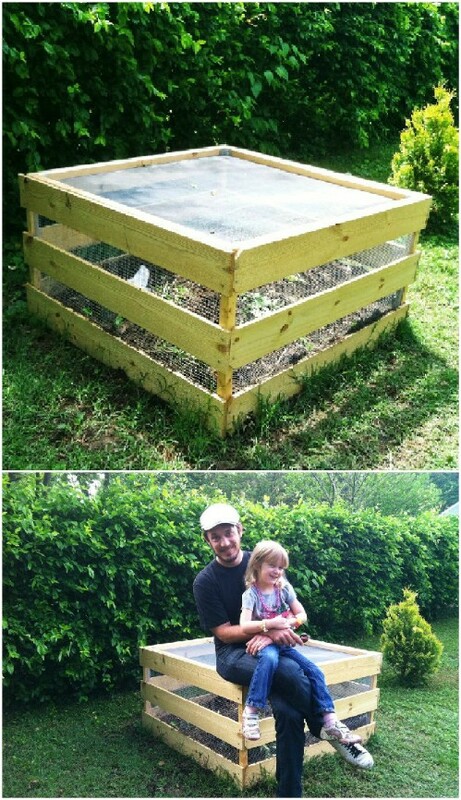 If you don’t have anything that you can repurpose to make a compost bin, you can simply build one from scratch. This compost bin plan is really easy to follow and this one will only take you a couple of hours to complete. It’s going to be a bit heavy so build it where you want to keep it. 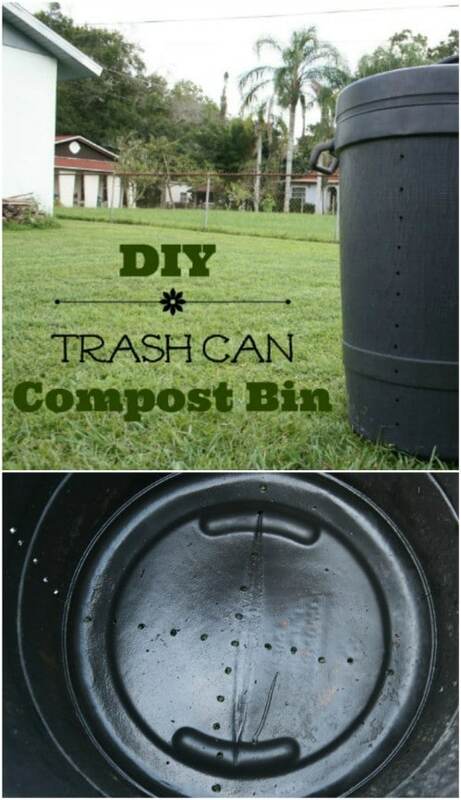 When all else fails, turn your trash can into a compost barrel. 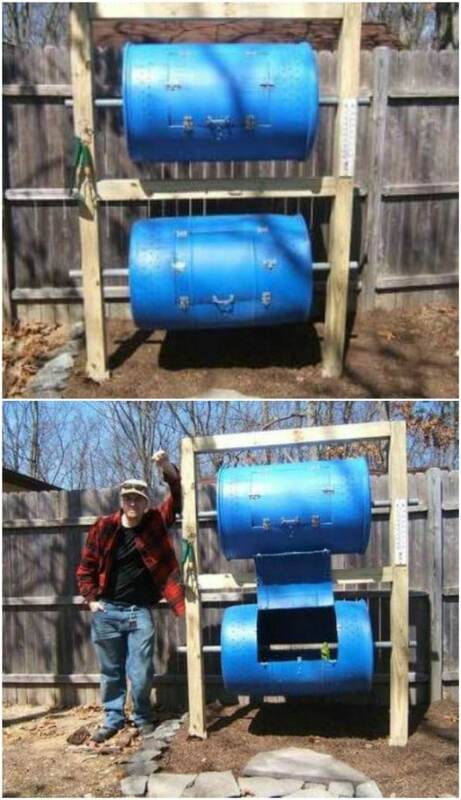 Any old plastic trash can will work for this one and there is virtually no work required to make it. If you have an old plastic can that has holes in it, just plug up those holes and use it for a compost heap. The plastic cans are somewhat lightweight too so that will help with rotating. 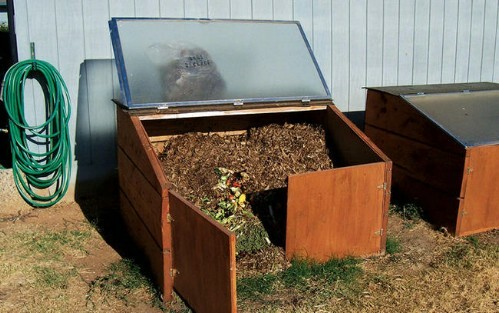 Here is another indoor compost bin that is perfect for those without a lot of space outdoors. 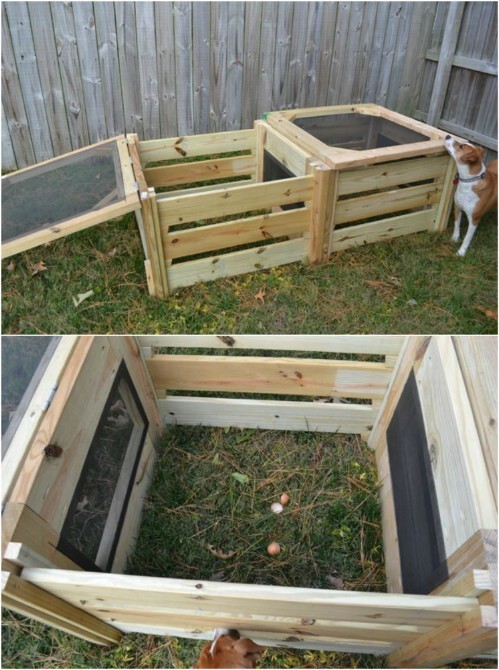 This one is pretty easy to build and has a pan at the bottom for catching your soil. Note that there is some sewing required for this one, for making the cover so this is a good opportunity to get out that sewing machine and get in some stitching practice. You can buy a wooden compost bin for around $150 – or you can use any leftover lumber that you have on hand and build it for free. I love this one…it is really easy to build and it is so decorative. It really has a nice farmhouse look to it with its planks and boards and it is perfect for those of you who are new to composting. If you want to start small, these little worm compost bins are perfect. They are super easy to put together…in fact, you’ll have them done in about five minutes. This is a great way to get the kids in on your composting excitement. You make these from plastic cups or empty laundry detergent cartons or something similar. This DIY compost bin is for indoors and before you get leery of having a compost bin inside your home, this one makes it odor free so there are no worries of smells wafting throughout the house. You can make this from just about any plastic container and it is the perfect DIY compost bin if you are just getting started and need to learn the ropes of composting before you build a larger outdoor model. You can incorporate an old unused shower door into your composting. For this one, you will need to actually build the bin out of wooden materials – or cinder blocks – and then you use the shower door to keep everything neatly inside. This is great because the door is clear so you can keep an eye on your compost while it’s doing its thing. I love finding new uses for old pallets. 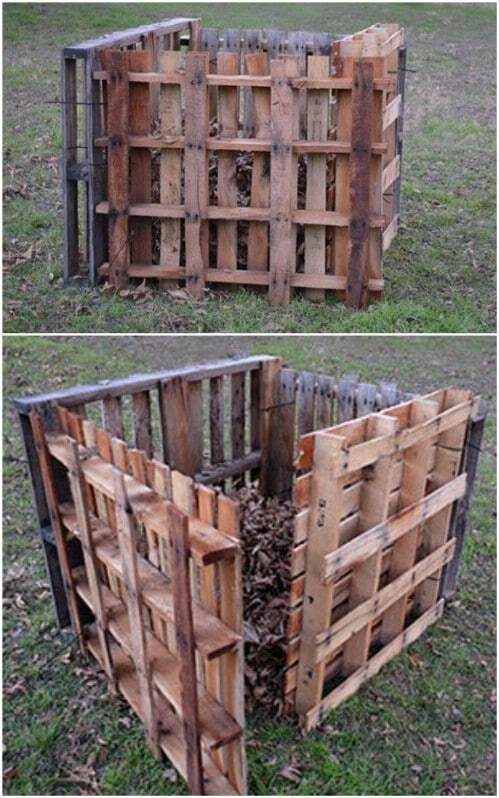 There really are tons of ideas for repurposing old pallets and this compost bin is one of them. 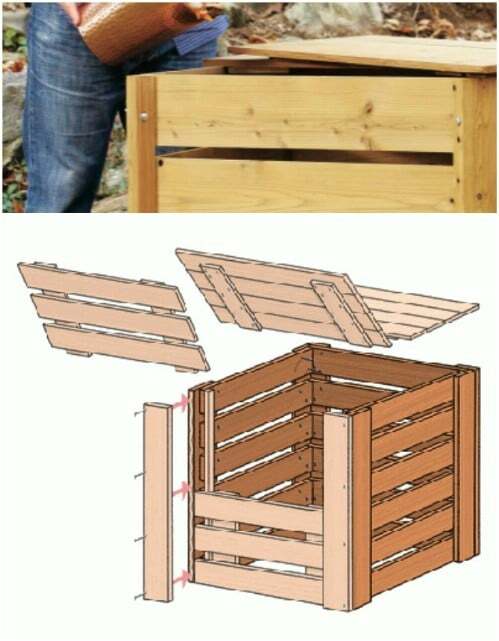 This one is super easy to build, too because the pallets are already put together so you just have to join four of them to make a box for your compost. 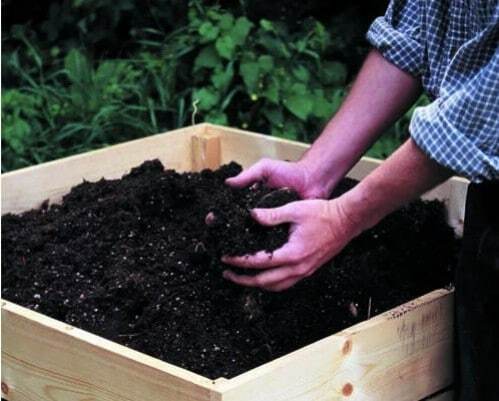 This is one of the easiest and probably least expensive DIY compost bins that you could build. This cheap and easy to build DIY compost bin has five layers of smaller bins that are all stacked on top of each other. This makes it really easy to rotate as you need to and this one is so inexpensive to build. You will spend much less than $100 to make this one, and even less than that if you happen to have a few boards on hand that you can use. If you want something really cheap and super easy to build, this vermicomposting bin can be made for less than $5. You just need a couple of nesting buckets and these can be any plastic buckets that you have on hand, as well as lids, some newspaper and your worms. This is a great one for the kids – if you want to teach them about composting while they are young. This easy and cheap compost bin can be made to go on your porch so it’s close enough to your scraps. You can make this one for less than $20 depending on the container that you choose. It is made from a clear plastic tote that has a hinged lid so it is really very easy to keep the odor out and since it is relatively small, turning the compost over to let it breathe is really simple. If you have straw bales on hand – especially if you have them for use with your fall decorating and need to get rid of them afterwards – you can use them to create a quick and easy compost bin. This one really won’t take you longer than an hour to complete. It’s a simple matter of stacking your hay or straw bales to create the compost bin. This is such an easy project and it’s really cheap if you have straw or know where you can get it for free. 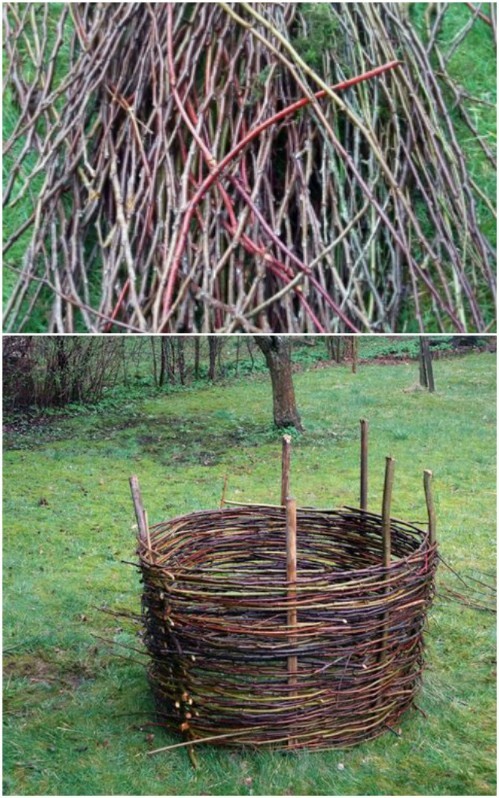 Did you know that you can weave your own compost bin? You can and it’s pretty easy to do. You can make this with willow rods, which are super flexible so they are really easy to weave with. Just weave them into a basket shape and then find a lid for your bin. This is such a decorative bin and it’s a free one too if you have the willow rods on your property. You know that rusty old wheelbarrow that is out in your yard? You can turn that into a compost bin and this one has a rotating barrel on it so it is really easy to keep it turned and fresh. You just attach a metal barrel to the turning gadget and your wheelbarrow catches all of the soil that is made. Once the wheelbarrow is full, you can just roll it out to the garden and empty it. 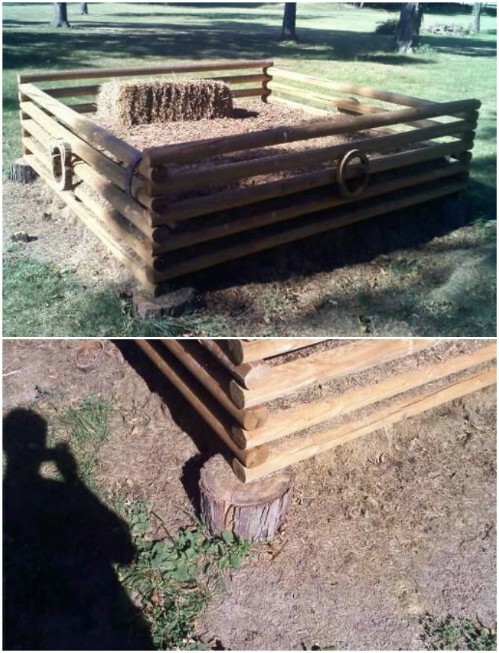 You can build your own wood barrel compost bin with just a few 2X4s and some nails. This one also rotates so you can keep your compost turned so that it stays fresh. And, it’s a really easy build that you can do with leftover boards from other projects. It’s also a really attractive looking compost bin, isn’t it? It’s great for that farmhouse decorating that you have going on outside. 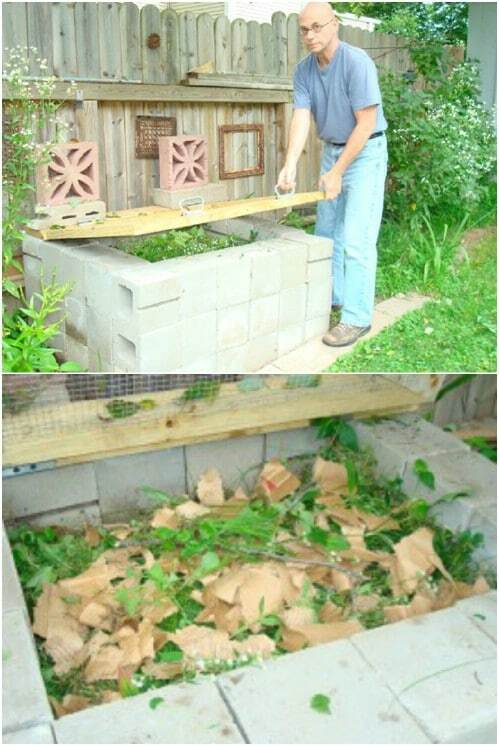 You can use old landscaping timbers to create this easy to build compost bin. If you don’t have any landscaping timbers on hand, this one is still really cheap. It will only cost you around $50 if you have to buy all of the materials to make it – and it’s a pretty simple process to put it all together. 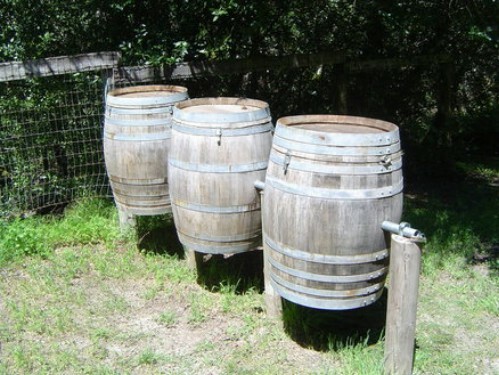 Build an entire compost station with a few old wine barrels. I love wine barrels for decorating – there are just so many DIY wine barrel decorations that you can make. 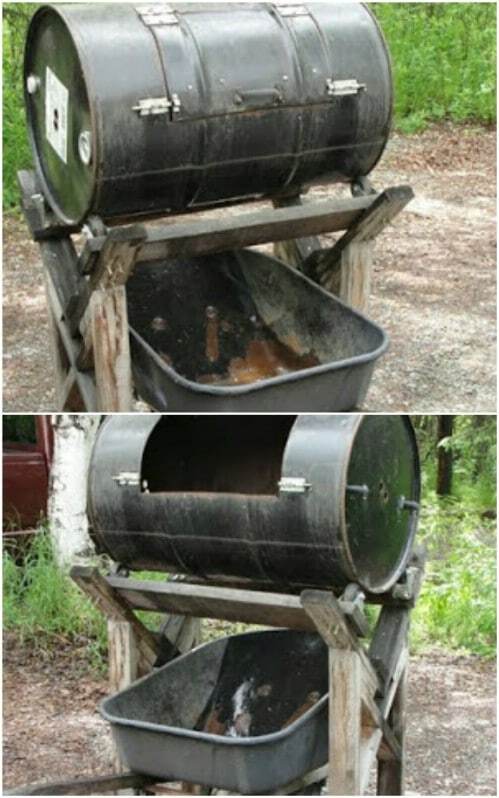 You can also use those barrels to make this adorable compost station and it turns so you can keep your compost rotated. 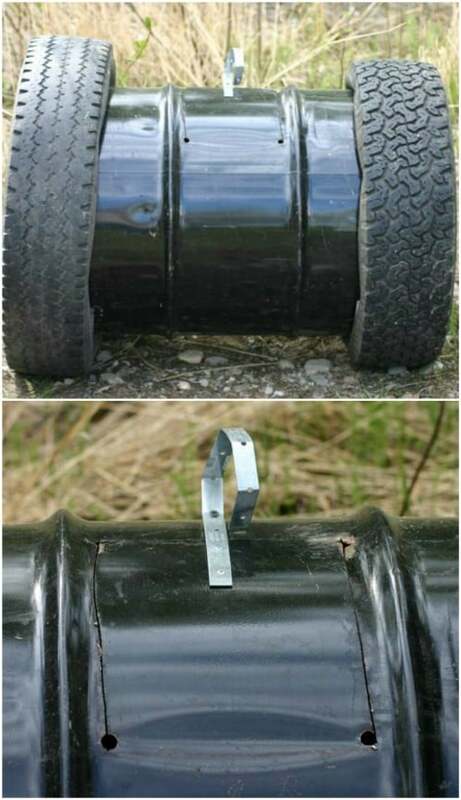 Depending on the number of barrels that you have on hand, you could make several of these and attach them all together to create enough compost for yourself and your friends and family.